A dryish and straightforward dark beer. Basic type pub with large beer garden at the side and back. Beer served from hatchway. Beer reasonable. Bus terminates opposite the pub. My best expierence in Germany was at this brewery. Very friendly staff. Brew master made a point to come to visit with us to discuss beer and to tell general stories about the area. We were there for the "Day of Beer" in April. Strongly recomended. The staff is friendly and ensures my glass is quickly refilled. I really enjoyed sitting in the biergarten drinking a pilsner. Georg and Kunigunda work magic in the kitchen. Herr Goller is great, most of the time. Good beer and wonderful dorf. Bob and Andrew give this quaint town its old world charm. 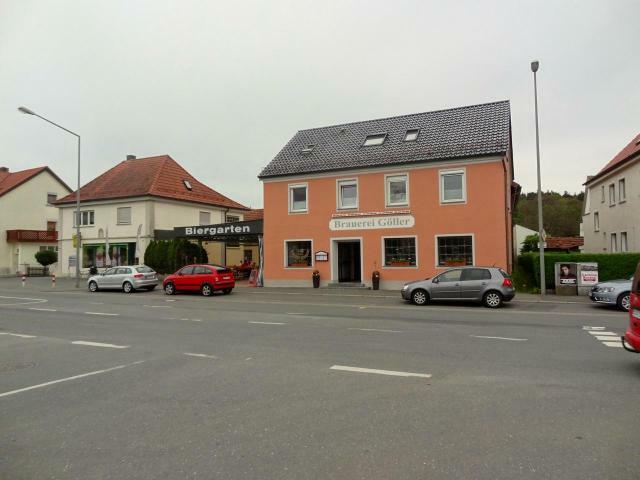 A quiet, large gaushaus with good food & friendly staff. The bier was a very good, full-bodied, taste. I recommend a visit, located on the main street of Drosendorf. I was invited to stay at this hotel as a friend. I was treated like family. The food was great. The staff was outstanding. Most important the Beer was remarkable. Thanks for the great memories. Pleasant pub and restaurant. The Weizenbock tasted like a regular Weizen. When I asked for a small taste of the Dunkelbock I was awarded a 90% full half-liter glass! A pleasant experience. MY FAMILY AND I LIVED AT GASTHOF GOLLER FROM 1973 TO 1975 WHEN I WAS IN THE ARMY. WE WENT BACK TO VISIT A FEW YEARS AGO. WE HAD A VERY GOOD EXPERIENCE HERE. GREAT FAMILY, GREAT BEER, GREAT FOOD, GREAT MEMORIES. Stopped here on a Friday afternoon while walking around the area in January. Drank two beers, I don't remember much about them (sorry). Also had a bit of lunch -- the typical rural Bavarian stuff. Charming place, plenty of other customers there as well. Glad to report it is alive and kicking. Visited in late July 2014. Took the bus out from Bamberg. We arrived a bit early but they were happy to let us sit at one of the outside tables out front. They were very pleasant about it. We realized later there was a larger beer garden in back. They have a few different beers. I had the lager and the Rauchbier. Both were good. Easy to get to by bus and one can also walk to Merkendorf from there in a matter of a 1/2 hour or so. Which number is lowest 71 or 3?